Some of the machinery displayed at the previous edition. The event, which is scheduled to take place from May 4 to 7 at the Qatar National Convention Centre (QNCC) in Doha, Qatar, will feature local and international suppliers and manufacturers looking to tap into the buoyant Qatar market. The show will host regional and international pavilions from Italy, France, Germany, India, Iran, China, Egypt, the UK, Turkey, Portugal, Austria, South Korea, Cyprus, Greece, Spain, Pakistan, Belgium, Taiwan, Thailand, Poland, the UAE and Saudi Arabia. The 12th international construction technology and building materials exhibition will be held amid a dynamic economy and expanding market, said Ventures Onsite, the construction projects tracking system of the Mena (Middle East and North Africa) countries. It puts the value of Qatar’s construction projects, which include buildings, infrastructure and energy, at $280 billion. Organised by IFP Qatar, the event is among the best attended exhibitions in the GCC for over a decade. Project manager of the show, Rawad Sleem, said: “Investment is reaching record levels in Qatar as interest in the construction market is skyrocketing due to the preparations for the 2022 Fifa World Cup and the goals of the Qatar national Vision 2030. “Qatar’s construction projects have been estimated at around $280 billion, and the booming market is being reflected by 80 per cent exhibition space booked in Project Qatar 2015, four months ahead of the show,” he added. “We are confident that Project Qatar 2015 will be the show’s biggest edition to date,” Sleem said. Project Qatar 2015 aims to support the country’s ongoing infrastructure development through one of its main concurrent events, Heavy Max 2015. 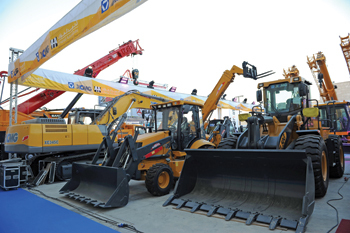 The 12th international exhibition for heavy machinery and largest event of its kind in Qatar meets the needs of large construction projects in terms of heavy equipment, vehicles, machinery and cranes. Heavy Max attracts a large number of manufacturers and suppliers from the world’s leading brands, showcases the latest cutting-edge construction machinery and equipment, and is an ideal platform to meet the demands of a billion-dollar-value construction market.